Okay, so this Twitter thing is completely useless for marketing purposes. I can see some value, albeit very little, in the service if you’re a teenager or an extreme Internet geek. But for any practical business purpose, it’s a waste of time. Do the clients of IBM, FedEx, or Jet Blue really care what the company or CEO is up to, right now? No. Twitter is old-school marketing in the fact that it’s the author telling the audience what they think they want to hear. All too often the stuff that comes out is useless information like, “I’m waiting on sushi” or “I need to insert code into this form to…” How does any of that help to build a relationship with the client? I don’t think it does. What’s your take on Twitter? The name of my post will tip you off to what I think. That’s a great post Kevin! Agreed. I was told my a friend that I needed to check it out. As I dug into it, I saw no purpose to it. For kids, now that’s a whole new ballgame. I think they will (or are) eating that up. But for executives or business people. . .not so much. It is UTTERLY useless. A platform for the type of useless small talk that I intentionally avoid. No thanks. Do a search (search.twitter.com) for any of your friends who use it. Note the absolute lack of nutritional value of all of those conversations. Participating in this over time leads to serious brain damage. Besides, the signal-to-noise ratio has gone off the charts. Although there may an occasionally interesting nugget of info, there are easier ways to dig them up. Anyone with the time to Twitter “for business” is really not working at all. Actually as a teenager, I think this is stupid. Utterly and completely useless as you’ve said. I mean sure I was there for the Myspace craze, and I do happen to have a Facebook. But Twitter? No thank you. In the same way that clients don’t care about how you’re waiting on sushi, I don’t care that you’re walking your dog or going to a restaurant. Has the public really gotten that attention-crazed? It seems as though Twitter is a vehicle for people who have both narcissism and A.D.D. I’m convinced users are those who are so self-absorbed that they think the world MUST be kept abreast of the minute-to-minute details of the most inane parts of their life, yet don’t realize how inane the details are, when they can fit the important info into 140 characters. Don’t know if you caught this one, but Business Insider / MarketingVOX released a study last month that shows that more than 60% of US Twitter users fail to return the month after signing up. Twitter’s growth has come, in part, as a result of celebrity exposure, which fueled a record number of people to sign up in March. 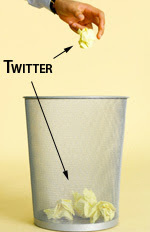 A Nielsen report estimates that over 60% of Twitter users quit after their first month. Twitter’s 40% retention rate is higher than it was a month ago. (Pre-Oprah retention averaged below 30%.) But social networking giants MySpace and Facebook manage a much higher retention percentage (60%) of new users each month. sorry if at some point my english sounds weird, is not my native language. I ABSOLUTLEY CONCUR…! TWITTER IS ANOTHER LAME ATTEMPT TO SUCKER MORE INDIVIDUALS INTO WASTING THEIR TIME ON LINE, VERSUS PICKING UP A TELEPHONE, OR ACTUALLY SEEING SOMEONE FACE TO FACE…I THINK “TWITTER” RATES UP THERE WITH “TEXTING”, REALLY WHERE DOES THE MASS “FOLLOWING” FOR THESE COMMUNICATION “OPTIONS” END..?! IT IS UNFORTUNATE THAT MOST OF SOCIETY TAKES ON A “MONKEY SEE, MONKEY DO” ATTITUDE WHEN IT COMES TO THINGS LIKE THIS…..
i am not sure if twitter is useless or not. i am sure it is useless to me. i am sure fleapapa.com with 1m users/postings is much more useful than twitter with 1b users/postings. i think my thought is good. Imagine thousands of people spending electric energy in offices and at their homes?! It’s against modern green movement. Indeed it’s a stupid service. I thought that twitter was useless at the beginning. Until I started trying it and taking a point Leo Laporte made. You only follow people you want. If you want to use it like the flavor of the month that celebrities are making it out to be then of course it’s useless. Post what kind of sandwich you are making. But that being said, if you want to use it more professionally then you just subscribe to people that are using it professionally. I get mostly tech related posts and they help me stay in the loop. Not too long ago, when the Iranian news was being filtered and held back, they were able to get news about what was happening because of twitter. Keeping free speech alive. It’s a part of the web 2.0, where things are more about interacting than just putting your voice out there. I can hear the latest postings on a website, the new downloads on xbox live and other interesting tech stories by going to one location. A lot of valid points were brought up here, but its only useless if you intend to use it like “my space” or “facebook” When in actuality it is perfect as a central hub to receive RSS feeds, blog updates, video updates and so-forth. The same can be said for facebook and the upcomming google wave. It’s a tool that’s been around since 2005, its only useless now because of how people like Oprah and Ashton Kutcher are using it, if you keep all this in mind and use it as a tool, it can be very beneficial. Twitter is totally a waste of time, I do not understand the success that has … but I believe and I hope it would last just a few more time because it seems so ridiculous to use. In my job Im required to work with twitter, facebook and all that junk. Facebook is fine as social networking, but neither Facebook not twitter junk are good for business, the only thing online business do with those is to add more junk to a social network of people who do not want the advertising, just to increase the number of fans..
Im tired of getting to my facebook and myspace requests from business; Im not there to receive the trash from online companies following a trend like stupids. twitter is useless. and i’m one of those teenagers.. lol. to me, all social sites are useless really. i mean most people just try to build their amount of friends up anyways. if you want to be social and meet new people, go out into the world and do it. You need to play with it more than a few times to get it. I thought the same thing in the beginning, now I find it to be a useful source of interesting info. Nice place to share some thoughts too. I actually like it. At least on twitter you don’t end up disliking or seeing how annoying people that you know are as is the case with FB. I get re-tweeted all of time which then carries around my business link. How could that possibly be bad? I agree with many of the earlier posts, such as Star’s – Twitter seems like a useless waste of time (yawn). I refuse to join Facebook, too. Another waste of time and poor security…. I am a member of LinkedIn — necessary for work contacts, etc. I got fed up with using Twitter and also Facebook for marketing my adult oriented business. It seems that no one really networks, but rather moans about what everyone else is doing as well as all of the other idle chatter and having conversations back and forth. I ended up deleting my Twitter and FB accounts a couple of days ago. I figure if someone wants to get in touch, they’ll find me through one of my sites and e-mail me the old fashioned way! Great post! to solve my problem. May be that’s you! Taking a look forward to look you.